Need a little more space in your bi-fold wallet to show off pictures of family members (or your cat)? Maybe you need more room for plastic cards. 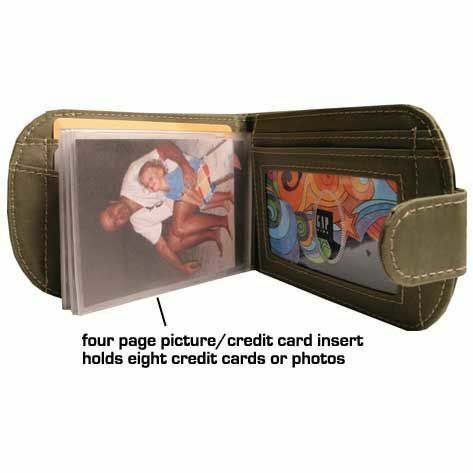 Our 4-page plastic sleeve bi-fold wallet inserts for credit cards and photos can hold 2 cards or 2 photos per page when put front to back. 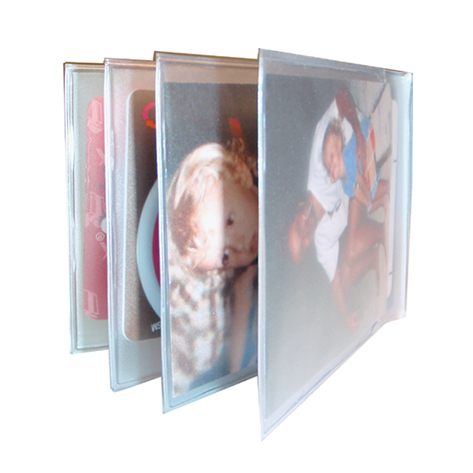 The sleeves open from the hinged end of the design, keeping pictures and cards safe and secure. The durable plastic wallet inserts are compatible with any bi-fold wallet that opens horizontally and will stand up well to daily use. There are so many ways you can use your wallet insert that you'll wonder how you got along without it. Use wallet inserts to hold credit cards to expand the storage capacity of your wallet, or create a mini brag book by inserting 1, 2 or 3 wallet inserts depending on how many cats you own. Our wallet card insert is also great for holding business cards. The 4-page design can display up to 8 cards or photos with ease. Credit cards are great, but what about ID cards and other important card-sized documents? This plastic insert is definitely up to the challenge, no matter what type of small document you need to store. It's great for personal IDs, key cards, security cards and even licenses. Big Skinny's bifolds are pretty spacious and have incredible storage options, but sometimes you just need a little extra space. That's where these Bifold Wallet Inserts for Credit Cards and Photos come in. They're excellent for getting some extra mileage out of your bifold experience. These inserts will easily slip in and out of your bifold so you can dedicate it to storing the cards you only need on rare occasions, as opposed to everyday. Just slip in the insert, cards and all, and you're good to go. The 5 star reviews really speak for themselves. Our customers love these inserts, and the price isn't bad either. They're so cost effective that you can stock up on inserts for the whole family and give each person a personalized wallet card insert filled with family photos as a thoughtful gift. If you are always digging for a different photo ID for different situations, this item will make it easy! Coupled with any of Big Skinny's wallets, it's all but guaranteed to stay put, unlike most other wallets that don't have the non-slip texture in the pockets. And the bulk of my Big Skinny World Zip even with the added Photo/Card Insert is noticeably less than the crappy wallet I got from a local discount retailer. Will not stay in place. My husband needed the extra windows, so I ordered these. The piece that slides under to hold it in place is not nearly still enough to hold it in place.. It just will not stay in place. It did not cost much, but it does not do the job--- I am going to see if I can find another one that has a stiff piece that goes under the card holder---I may be able to get one at Wal-Mart. I use it in the zippered bifold wallet with 3 cards in each slot!!! Aflter a long time, and hard use, it is still as brand new. It's so nice to carry great pictures of your kids again vs the cell phone ones which might be dark or not of a flood pose. I'm loving this procuct in my new big skinney wallet! Great products! Fits great in my L shaped wallet. Perfect for things other than credit cards. That was the only thing missing from the Taxicat. Now it's not missing.